The Republic of Ilirida (Albanian: Republika e Iliridës) is a self-proclaimed state of Macedonia, declared twice by Nevzat Halili, in 1992 and in 2014. The Republic of Ilirida was a territorial entity self-proclaimed in January 1992 by Party for Democratic Prosperity activists in Struga, Republic of Macedonia, the main organizer being Nevzat Halili. 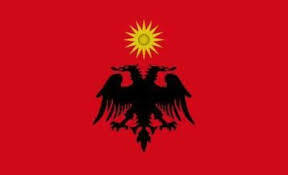 The republic was proclaimed as a result of a referendum on the status of the Albanians which was held in January 1992 and declared illegal by the Macedonian government. 74% out of 92% of those eligible to vote, voted for the autonomy of the Albanians. The republic would cover approximately half of Macedonia's territory mainly where the Albanians were the ethnic majority in the west and aimed at uniting all Albanians under former Yugoslavia and protecting the other ethnic minorities from perceived discrimination.Later on, the aim of the republic was that of favoring the federalization of Macedonia. On September 18, 2014, a small crowd of Albanians assembled in Skopje to declare the formation of the Republic of Ilirida.According to Nevzat Halili, the self-proclaimed president, the right of Albanians in Macedonia to self-determination and the proclamation of Ilirida as an autonomous region is based on the United States Constitution. Halili said he seeks for Ilirida to form a confederation with the Republic of Macedonia called Ilirida-Macedonia, based on the former State Union of Serbia and Montenegro.If his plans are ignored by the government of Macedonia, he said he will organize a referendum. The failed diplomacy, iinequality and discrimination of the Albanians lead to the creation of the paramilitary. The Albanian Paramilitary in Macedonia was a Paramilitary organisation of the Albanians of the Republic of Macedonia in 1993 that was constructed by Nevzat Halili. The organisation was discovered by the Macedonian counterintelligence and participants were arrested and convicted. On 10th November 1993 Deputy Minister of Defense Hisen Haskaj and Deputy Minister for Health Imer Imeri, both Albanian-Macedonian, were arrested under the suspicion of helping of creation of the so-called Albanian Paramilitary in Macedonia. United States Code. House, Office of the Law Revision Counsel. p. 739. Bechev, Dimitar. Historical Dictionary of the Republic of Macedonia. 4501 Forbes Boulevard, Suite 200, Lanham, Maryland 20706: Scarecrow Press, INC. p. 93. ISBN 978 0 8108 5565 6. Retrieved 2014-09-21. Ramet, Sabrina P. Whose Democracy? : Nationalism, Religion, and the Doctrine of Collective Rights in Post-1989 Eastern Europe. 4720 Boston Way, Lanham, Maryland 20706: Rowman & Littlefield Publishers, INC. p. 79. ISBN 0 8476 8324 9. Retrieved 2014-09-21. Shea, John. Macedonia and Greece: The Struggle to Define a New Balkan Nation. Box 611, Jefferson, North Carolina 28640: McFarland & Company, Inc. p. 272. ISBN 0 7864 0228 8. Retrieved 2014-09-21. The Evolution of Civil-Military Relations in South East Europe. p. 20. ISBN 978 3 7908 1572 6. Retrieved 2014-09-21. Janusz Bugajski (1995). Ethnic Politics in Eastern Europe: A Guide to Nationality Policies, Organizations, and Parties. M.E. Sharpe. pp. 116–. ISBN 978-0-7656-1911-2. Marusic, Sinisa Jakov (19 September 2014). "Albanians Declare 'Republic' in Macedonia". Balkaninsight. Retrieved 2014-09-21. Federalism, Regionalism, Local Autonomy and Minorities: Proceedings, Cividale Del Friuli (Italy), 24-26 October 1996 : Conference. Council of Europe. 1 January 1997. p. 82. ISBN 978-92-871-3434-9. Marusic, Sinisa Jakov (September 19, 2014). "Albanians Declare 'Republic' in Macedonia". Balkaninsight. Retrieved September 20, 2014. "Albanians proclaim “Republic of Ilirida” in Macedonia". InSerbia. September 19, 2014. Retrieved September 20, 2014. "Republic of Ilirida" declared in Macedonia". b92. September 19, 2014. Retrieved September 20, 2014.